It’s only been a little over a year since Jacob Jonas officially established his own company, Jacob Jonas The Company, but he and his group have big plans for the dance community. 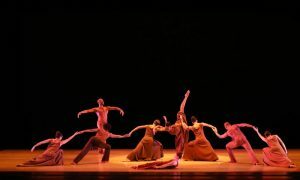 They’ve already made a huge impression at the Dance Camera West Festival this past May; the company is invited to perform at the Jacob’s Pillow Inside/Out Festival in July; and plans are in the works for the company’s next full-length production featuring guest choreographer Donald Byrd. Amidst all of these exciting performances, however, lies an underlying, stronger desire for Jonas: to build the art of dance to be a more united, community-driven, inspiring and popular art form. It’s a big challenge, but Jonas, the company’s fearless leader, could be the guy to do it. Jonas started his dance career as a street performer but says that, although he learned a lot as a dancer, he never truly felt fulfilled. Thus began his journey to create his own work. Some encouraged him to choreograph, and people took notice. In 2013, Jonas placed third at the Capezio A.C.E. Awards and was able to create his own full-length production. Shortly thereafter, Jacob Jonas The Company was launched. An image from Jacob Jonas The Company’s Instagram event #CamerasandDancers. Photo courtesy of Jonas. The company is based in Los Angeles and, for the time being, performs primarily Jonas’ choreography, which he says includes elements of contemporary ballet, breakdancing, popping and circus art. Because of this eclectic style, he says he looks for dancers who have an open mind and “a lot of tools in their toolbox”. It is this sense of community, of coming and working together, in which Jonas seems to thrive. In fact, his work, Impact LA | A Generational Piece, which premiered at the Dance Camera West Festival, brought together 25 of the most prestigious dancers and choreographers on stage in a single dance event. 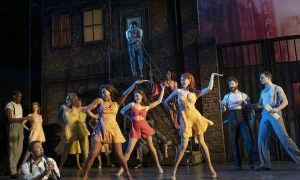 One by one, these dancers, including former Alvin Ailey dancer Hector Mercado, Emmy-winning choreographer Anita Mann, both of whom where consultants on the piece, and more, improvised and stated their name, age and how dance has impacted their life. The company’s next big collaborative event is slated for January 2016 – a full-length production that Jonas plans to be the first of an ongoing series, The Concert/Commercial Series. Jonas, along with one commercial dance choreographer and one concert dance choreographer, will all split a bill under a theme. For January, the theme will be “space.” Jonas will be collaborating and consulting with David Tytler, a professor in Physics at UC San Diego with a focus on Observational Cosmology, and Donald Byrd will be one of the guest choreographers. 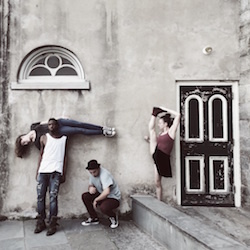 Jonas, who began his career performing on the street and other site-specific venues rather than on stage in a theater, brings this idea of non-traditional performance spaces to his company. In fact, for “Spaced”, plans are in the works to present the piece at a venue that focuses on cosmology. 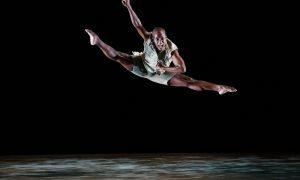 Former Alvin Ailey dancer Hector Mercado improvising in Jonas’ recent work at the Dance Camera West Festival. Photo by Will Adashek. Performing in non-traditional venues also aids in Jonas’ vision of making dance more accessible, especially to the younger generations. And his goal depends not only on his own work but also upon the efforts of the arts community at large. In addition, Jonas hopes that theaters, local ones, will start to focus more on the local companies, offering them a place to perform and, again, exposing communities to a wider range of dance, not just national companies that have name recognition. Jonas offers himself – and his company, which already he calls a “family” – as the “umbrella” for this feat. He has created various community events – an Instagram meet-up called #CamerasandDancers, and also a monthly improv night in Los Angeles – in the hopes of developing a strong community of dancers and artists. To learn more about Jonas, his company and the group’s ongoing and compelling projects, head to www.jacobjonas.com. And be sure to follow the company’s Instagram event #CamerasandDancers. Photo (top): Jacob Jonas in rehearsal. Photo by Carl Shrawder.